The Sagittarius Star Cloud lies at an approximate distance of 10,000 light years from Earth and has an apparent magnitude of 4.6. It has the designation IC 4715 in the Index Catalogue of Nebulae and Clusters of Stars. Messier 24 is about 600 light years wide and lies in the Sagittarius Arm of our galaxy, the next inner spiral arm to our own. It occupies an area 90 arc minutes in apparent diameter and contains different types of objects, including stars and clusters that lie at a distance of 10,000 to 16,000 light years from Earth, which gives the cloud a significant depth. In the night sky, the star cloud appears about nine times larger than the full Moon. Messier 24 is the densest concentration of individual stars that can be seen in binoculars. 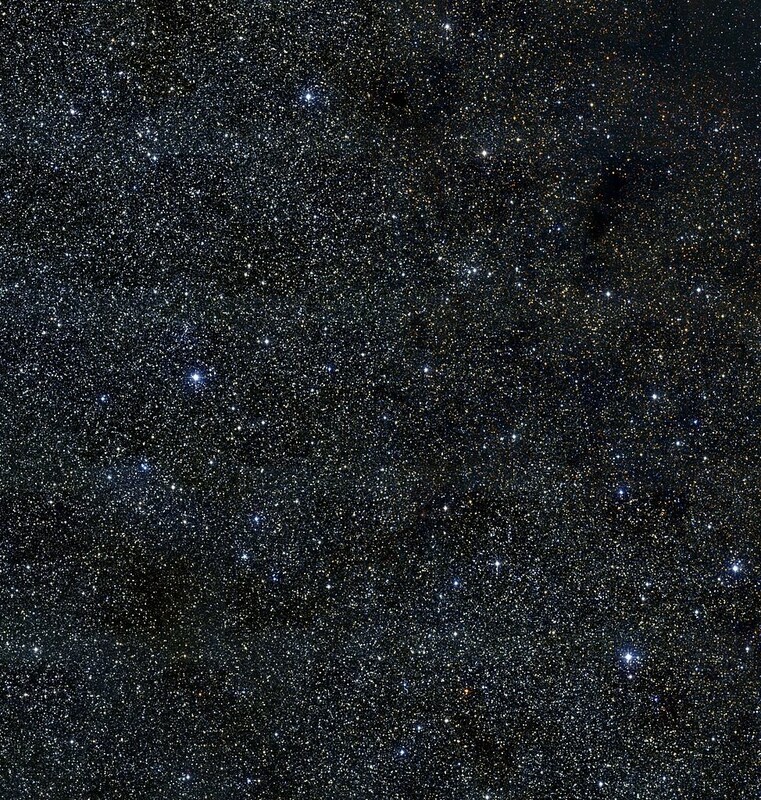 About 1,000 stars are visible in a single field of view. The star cloud is best seen in binoculars and telescopes with a field of view of at least 2 degrees, at low magnification. It can be found 4 degrees north of Polis, Mu Sagittarii, the bright blue giant star above the Teapot asterism, or 7 degrees north and a little west of Kaus Borealis, the star that marks the top of the Teapot. The star cloud can also be located by extending the line from Kaus Australis to Kaus Media to the north. Even small telescopes will resolve a large number of stars in different patterns. The open cluster NGC 6603, which lies in the brightest part of the cloud, can be seen in 4-inch and larger instruments. The best time of year to observe M24 is in the summer months. 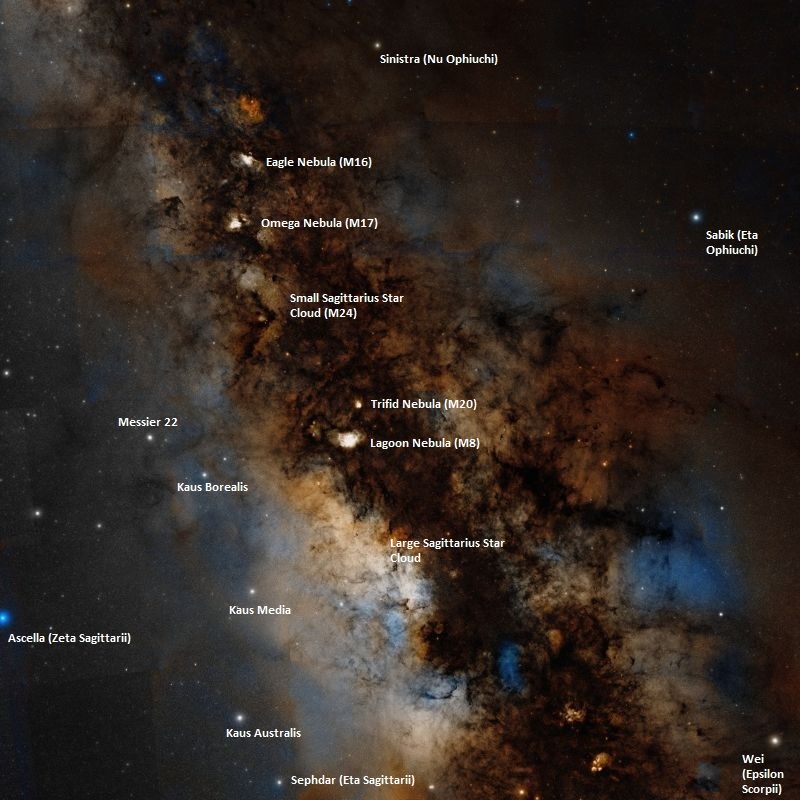 The Sagittarius Star Cloud can be seen at any time that the Milky Way itself is visible. In good conditions, the star cloud’s size and brightness make it easy to find without binoculars. M24 is unique among Messier objects, which are mostly single, well-defined deep sky objects – star clusters, nebulae and galaxies – while the star cloud is not really a deep sky object but a collection of millions of stars found along the plane of the Milky Way and seen through a gap in the galaxy’s dust lanes. Without the obscuring dust and gas, the entire Milky Way would appear as bright as M24. Messier 24 is one of the three Messier objects that aren’t deep sky objects. The other two are the double star Winnecke 4 (WNC 4) in Ursa Major, catalogued as Messier 40, and the asterism Messier 73, formed by four stars that aren’t physically associated with each other, found in Aquarius constellation. The Sagittarius Star Cloud is located in the vicinity of the Omega Nebula (M17) and open cluster Messier 18, which lie to the north of M24, the open cluster Messier 23, located west of M24, and Messier 25, another open star cluster, found a few degrees to the east. Messier 24 contains NGC 6603, a faint open cluster of about 30 stars, located in the brightest region of the star cloud. The cluster was discovered by the English astronomer John Herschel between 1825 and 1833. It has a visual magnitude of 11.4 and is some 9,400 light years distant. NGC 6603 covers an area 5 arc minutes in apparent diameter, corresponding to a linear diameter of about 14 light years. The hottest stars in the cluster have the stellar classification B9, giving NGC 6603 an estimated age of about 100 million years. The cluster’s brightest stars are of magnitude 14. The designation NGC 6603 is sometimes incorrectly used for the entire Sagittarius Star Cloud. The brightest star in the Sagittarius Star Cloud is HD 167356, a white supergiant with the spectral classification A0Ia and an apparent magnitude of 6.05. The star is classified as an Alpha-2 Canum Venaticorum variable. 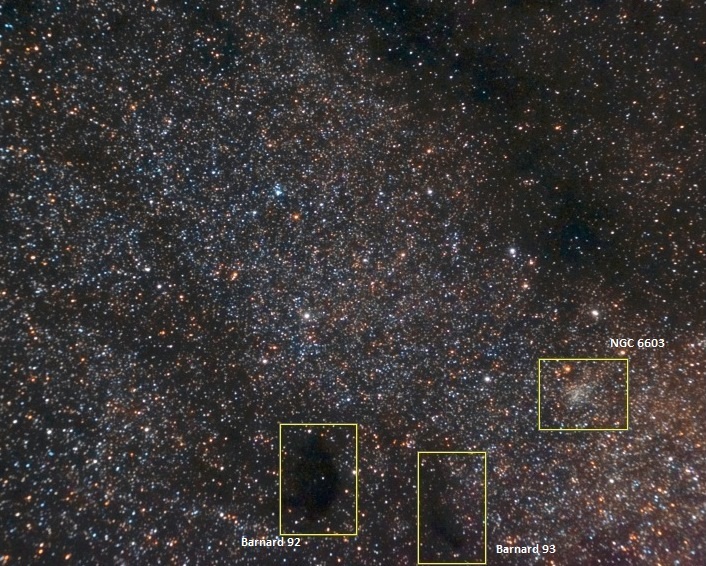 M24 contains three more stars with a visual magnitude between 6.5 and 7.0. Messier 24 is sometimes called the Small Sagittarius Star Cloud, to distinguish it from the Large Sagittarius Star Cloud, which lies further to the south and consists of stars in the galactic bulge that are not obscured by interstellar dust. The Sagittarius Star Cloud contains several dark nebulae which are easy to observe because of the bright background that M24 provides. The most prominent of these is Barnard 92, an oval-shaped dark nebula stretching across a quarter of a degree in the northwestern part of M24. Barnard 92 got the nickname the Black Hole before the term started to be used for black holes as we know them now. The dark nebula was discovered by the American astronomer Edward Emerson Barnard in 1913. It was one of the first objects of its kind discovered by Barnard. 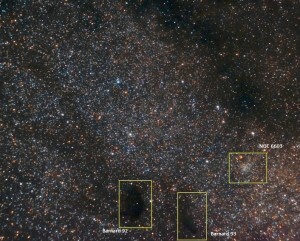 Barnard 92, Barnard 93 and NGC 6603 in M24. Barnard 93, another dark nebula, can be found only a third of a degree to the northeast. M24 also contains the dark nebulae Barnard 304 and Barnard 307. Messier 24 is also home to two additional clusters, considerably fainter than NGC 6603. The clusters lie in the vicinity of the two larger dark nebulae. 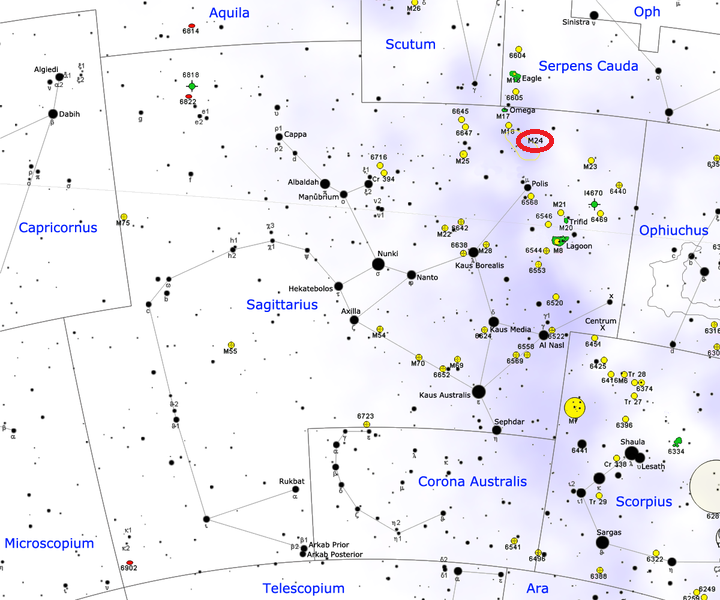 Collinder 469 is located near the lower right end of Barnard 92, while Markarian 38, also catalogued as Biur 5, lies to the south of Barnard 93. The Sagittarius Star Cloud also contains two planetary nebulae, catalogued as NGC 6567 and M 1-43, and several variable stars, including the long-period Cepheid variable WZ Sagittarii, the Alpha Cygni variable V 4384 Sagittarii, and the Alpha-2 Canum Venaticorum variable V 4387 Sagittarii. Messier 24 bears some similarity to NGC 206, a large, bright, conspicuous star cloud located in a spiral arm of the nearby Andromeda Galaxy (M31). In the same night [June 20 to 21, 1764], I have discovered on the same parallel as the star cluster I have just been talking about & near the extremity of the bow of Sagittarius, in the milky way, a considerable nebulosity, of about one degree & a half extension: in that nebulosity there are several stars of different magnitudes; the light which is between these stars is divided in several parts. I have determined approximately the position of the middle of this cloud of light; its right ascension is 270d 26′, & its declination 18d 26′, south. 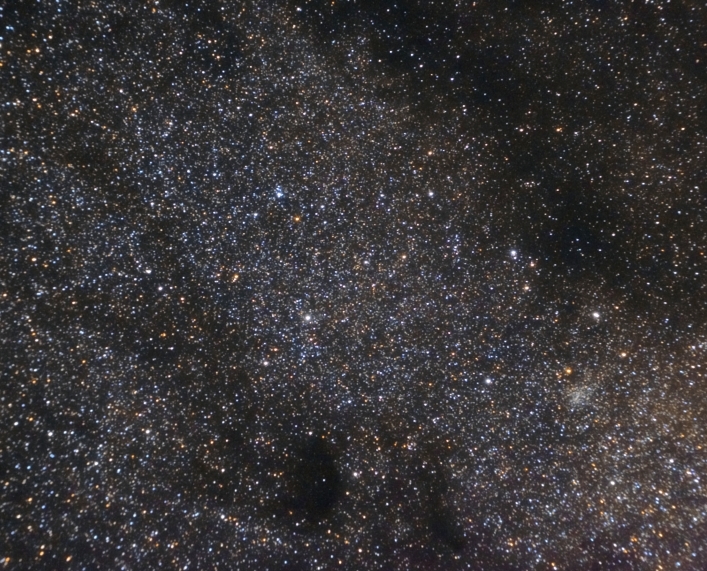 A beautiful field of stars, below the sinister base of the Polish shield [Scutum], and in a richly clustering portion of the Milky Way. This object was discovered by Messier in 1764, and described as a mass of stars — a great nebulosity of which the light is divided in several parts. This was probably owing to want of power in the instruments used, as the whole is fairly resolvable, though there is a gathering spot with much star dust [NGC 6603]. A double star, H. and S. [Herschel and See] No. 264, follows in the sf quadrant, and a wider one sp, which is the No. 263; these must be the objects alluded to by Piazzi, Nota 25, Hora XVIII., “Quatuor sequuntur ad austrum, quorum una dupley.” A line led from Alpha Aquilae to the south-west over Lambda Antinoi [referring to the obsolete constellation Antinous, now part of Aquila), and configured as far again, reaches 24 Messier. Messier 24, the Sagittarius Star Cloud. Atlas Image mosaic obtained as part of the Two Micron All Sky Survey (2MASS), a joint project of the University of Massachusetts and the Infrared Processing and Analysis Center/California Institute of Technology, funded by the National Aeronautics and Space Administration and the National Science Foundation.